Today I'm dropping in with a holiday health goal. 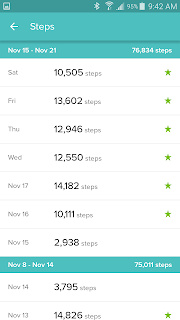 I have challenged myself to 600,000 steps throughout November and December. The holidays are a time of gratitude. Thanksgiving is tomorrow and that's the biggest gratitude day of all. I'm thankful for so much in my life. That could not be more evident as I watch the news each night and see what perils others face - whether it be local or national news. I'm thankful for a husband who is a wonderful provider and companion. He brings me such happiness and together we fill our home with love and laughter. I'm thankful for a family that is supportive and always concerned about our well being. Even though they aren't close as far as distance is considered they are always close in our hearts and a phone call away. I am thankful for friends - new and old friends alike. Patrick and I have put in effort to maintain friendships with college friends as well as branch out of our comfort zone where we are now and make new friends with those that surround us. I'm thankful to live in a community that provides so much for us. We live a fulfilled life where we are and for that we are grateful. I'm also thankful for my health. Without good health I would not be able enjoy this fulfilled life. I would not be able to enjoy activities with my husband, outings to visit my family, dinner clubs with friends, or special events in our community. I recognize that putting my health first must be a priority to live a life well lived. This is one of the reasons I meal plan. I've learned that the less structured the meal plan is, the more often we let slip in take out. Cooking each night allows us to control what we're putting into our bodies but it also gives Patrick and myself time to connect with each other in the evenings after working days. But I'm not chiming in today with reasons to meal plan; I'm sharing my reason to be active! The holiday season is filled with celebration. It's a joyous time to share with my husband, our families, and our friends. There will be feasts and parties and cheers. And I look forward to all these happy occasions that celebrate this time of the year. However I want to put my health first. I want to focus a bit on me during the holidays. So I'm doing just that by challenging myself to 600,000 steps. It's not 10,000 steps every day because just like our meal plan includes desserts and holiday parties are on our calendar I believe in "everything in moderation." 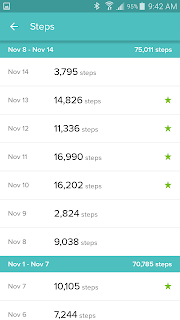 Some days might not hit 10,000 steps - maybe we were traveling to see friends or doing a house project or the sun set super early and that prevented me from grabbing a walk or jog but the next few days will give me the opportunity to make up for that. So how am I doing?! As of last night I had taken 250,409 steps. I'm right on track to meet my goal. 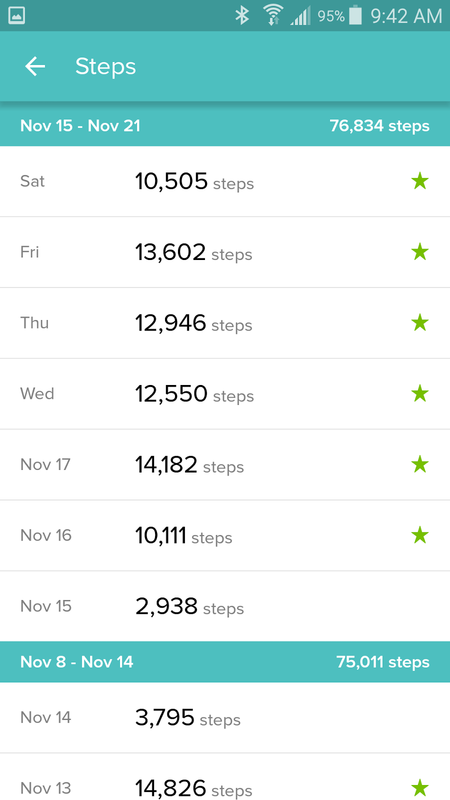 Here are the screen shots of my FitBit app and you can see my weekly progress. 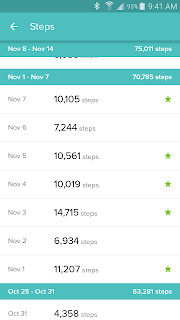 Week 1 was 70,785 steps; Week 2 was 75,011 steps; and Week 3 was 76,834. I'm glad I gave myself this challenge. 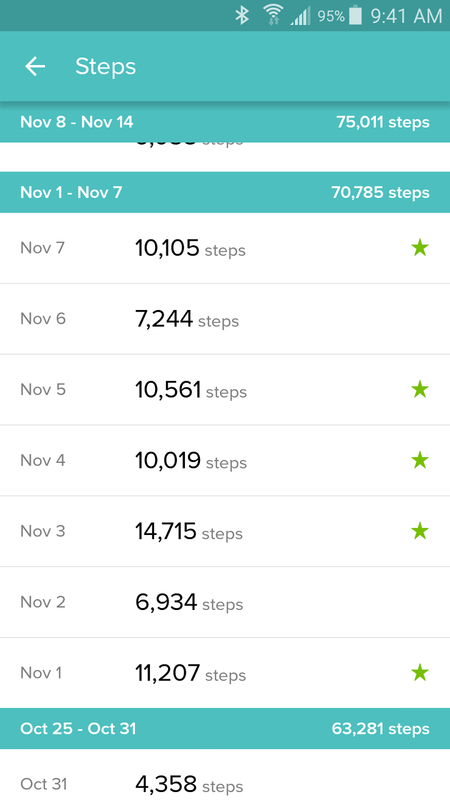 I really haven't been this consistent with steps since I got the FitBit. I've definitely been more mindful about meeting the step goal but if I missed for a day I never made up for it on another day. I am pushing myself now to meet this challenge and my body thanks me. I feel happy inside! I've been walking and jogging outside quite a bit and being active outdoors really keeps me motivated. I know we'll all be busy putting others before ourselves this holiday season. But remember that you're important too! Take time to focus on you so you can be present for others around you and savor the holiday season - whether it be walking around the neighborhood, reading a book, or lighting a candle and meditating. And if you'd like take join me in getting some steps. 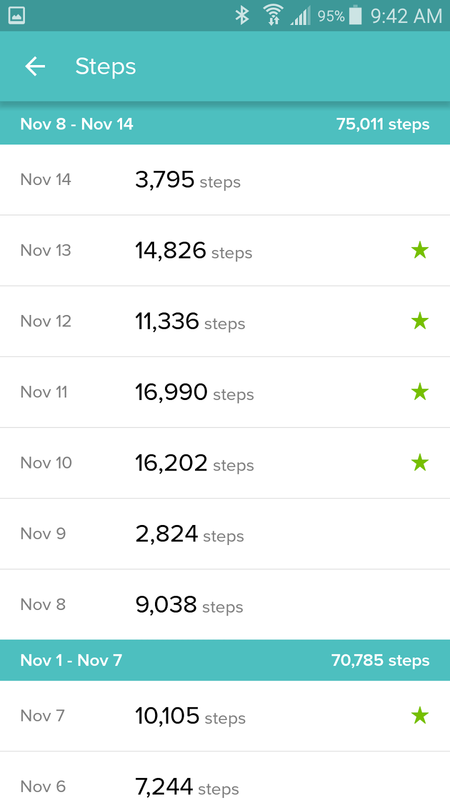 Feel free to hop on my challenge for December and take 300,000 steps before the New Year chimes in.